New Solo Movie Mighty Muggs Figure 4-Pack now available! 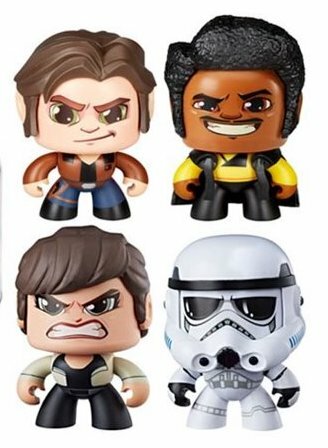 Walmart has debuted a brand new Solo: A Star Wars Story themed Mighty Muggs action figure 4-pack! This pack costs $85.58 and shipping is free. As of this writing there are only 5 of these 4-packs left in stock so order soon. The awesome is back! Star Wars Mighty Muggs are the classic collectible figure, and they’re better than ever. Each figure is packaged in a stackable, sturdy box and is easily removed without damaging the packaging – just cut the tape, turn the fasteners, and it’s free. And putting your figures back in the boxes for display is just as easy! Each 4-inch figure has 3 different faces – just push down on the top of their skulls and the figures can go from angry to happy to sad, or other emotions. You can even access the mechanism without having to open the packaging.